Trump’s health has already become a subject of mass concern (and mockery), when he slurred words during his speech on the recognition of Jerusalem as the capital of Israel. This time viewers observed another weird habit. 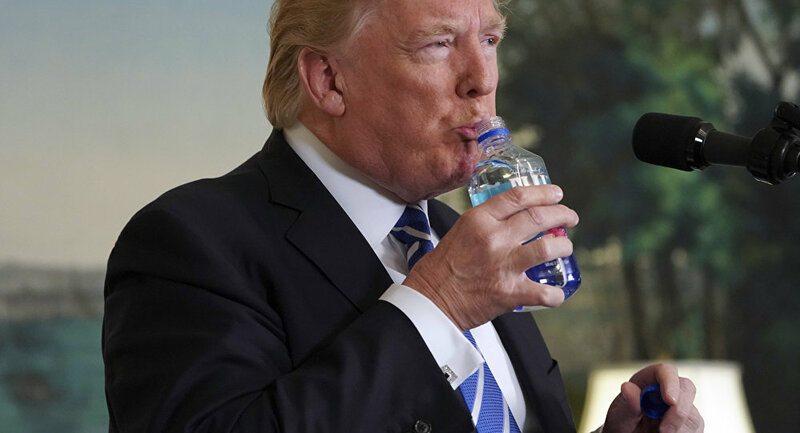 While delivering a speech in Washington, as he unveiled his National Security Strategy, the US President used a moment of applause to take a small break and drink some water. What struck viewers most was his bizarre manner of holding the glass using both hands. — Rogelio Garcia Lawyer (@LawyerRogelio) 19 декабря 2017 г. — Kathy Hardin (@ugottalaff937) 19 декабря 2017 г. — Bandit Aléatoire (@BanditRandom) 19 декабря 2017 г. — Tom the Dancing Bug (@RubenBolling) 18 декабря 2017 г. — Labomski (@labomski) 19 декабря 2017 г. — David & Josh (@RockandLedge) 18 декабря 2017 г. Again? Yes, this is concerning. Something neurological is definitely wrong here, and Alzheimer's is tbe prime suspect. It can progress faster under stress. — Deborah (@debi66) 19 декабря 2017 г. Anyone else think he holds glass in both hands to cover up tremors? Another symptom of dementia. — LesleyC (@ClaffL) 19 декабря 2017 г. — Norma (@norma_demby) 19 декабря 2017 г. — b thwaite (@TwoSparrows) 18 декабря 2017 г.
Ironically, Trump has previously mocked US Senator Marco Rubio for the way he drinks water. During his speech he paused to reach for a bottle of water while keeping his eye on the camera. Trump tweeted in response: "Next time Marco Rubio should drink his water from a glass as opposed to a bottle—would have much less negative impact." The White House has already called all speculation over Trump’s health “ridiculous,” when he slurred words during a speech on Jerusalem, but reported that the president would undergo a full physical examination to dispel all the myths.